This page gives an overview of the many types of resources, information and support our office can provide to new or existing businesses, including contact and financial resources and the many local, state, regional and federal assistance programs available. For assistance, please contact the Retail Services Specialist, Cara Knauf, at the Chamber of Commerce at cara@newulm.com or call 507-233-4308. Held the first Tuesday of every other month at the Chamber of Commerce office, 1 N. Minnesota St in New Ulm from 6-7:30pm. Is entrepreneurship right for you? 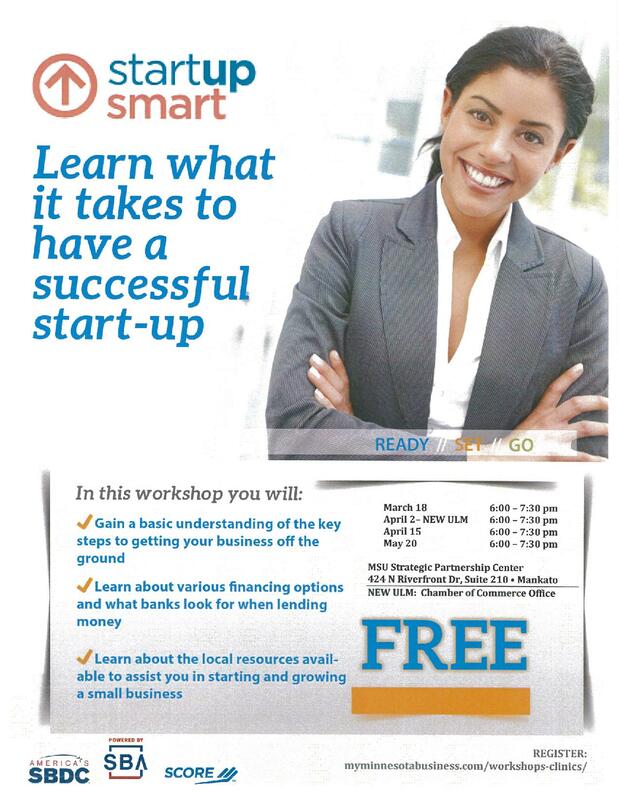 In this free Start Up Smart workshop you will gain a basic understanding of the essential steps to getting your business off the ground and the many local and online resources available to help you. Presented by a consultant from the Small Business Development Center in Mankato. Dates in New Ulm for 2019 are: February 5, April 2, June 4, August 6, October 1, and December 3. Questions or need more information? Call Cara at 507-233-4308 or email cara@newulm.com. 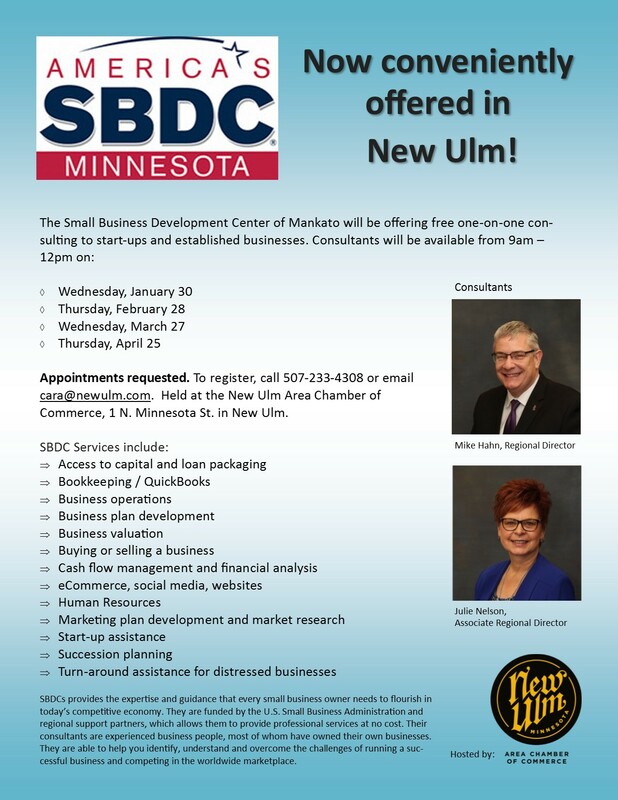 Free SBDC Consulting Appointments now available in New Ulm! Appointments requested. To register, call 507-233-4308 or email cara@newulm.com. Held at the Chamber of Commerce office, 1 N. Minnesota St in New Ulm. Grow Minnesota is the premier private-sector led statewide business retention, business assistance, and business expansion program in Minnesota. Our team helps Minnesota businesses locate the right resources and provide professional assistance so your business will succeed, stay and grow in our state. Our wide ranging database can be accessed quickly and includes a wealth of researched statewide resources. Brief descriptions of resources and direct links are focused on saving busy business people valuable time and money. Resources include: small business loan programs, information on how to start a business, resources for entrepreneurs, workforce recruitment assistance and training grants, exporting services and seminars, information on environmental permitting and regulations, energy use and waste reduction programs. Minnesota Department of Employment and Economic Development (DEED) is the state's principal economic development agency. DEED programs promote business recruitment, expansion, and retention; international trade; workforce development; and community development. Learn what DEED is all about and the ways we help job seekers, businesses and communities. information, programs and services to help businesses succeed. Guidebooks for starting a small business, protecting your intellectual property, dealing with employment law issues, and more. Minnesota Business First Stop streamlines the development process for complex business startups, expansions or relocations that involve financing, licensing, permitting, and regulatory issues that overlap multiple state agencies. The Minnesota Business First Stop Team is managed by the Department of Employment and Economic Development and includes representatives from eight state agencies. We help companies at any stage of development, from new ideas to business startups to established companies with products and services ready to market. Just complete and submit this electronic inquiry form and we'll contact you. SBA provides small businesses with an array of financing for small businesses from the smallest needs in micro-lending - to substantial debt and equity investment capital (venture capital). In keeping with the mandate of Section 15(g) of the Small Business Act, SBA's Office of Government Contracting sets goals with other federal departments and agencies to reach the statutory goal of 23 percent in prime contract dollars to small businesses. This office also provides small businesses with subcontracting procurement opportunities, outreach programs, and training. The Minnesota Resource Guide contains information for small businesses that is local to the state of Minnesota. In addition to SBA programs and services, it includes contact information at the local, state and federal levels. Small Business Resource magazine is the most complete guide to starting and expanding your business. You'll find information on counseling, training, capital, contracting, disaster assistance, business advocacy, local directories and more. SBDCs provide the expertise and guidance that every small business owner needs to flourish in today’s competitive economy. The South Central Minnesota SBDC is part of the Minnesota network of regional centers. We are funded by the U.S. Small Business Administration and regional support partners, which allows us to provide professional services at no cost. We offer one-on-one consulting to established businesses and start-ups. We also help to find and secure the capital you need to operate and expand. Finally, we offer an array of training sessions at no cost or nominal cost. Eleven reference volumes composed of actual business plans written by entrepreneurs in North America who are seeking financing for their business. Southern Minnesota Initiative Foundation is a regional development and philanthropic organization that fosters economic and community vitality in 20 counties of southern Minnesota through a culture of collaboration and partnership. We envision a prosperous and growing region with vibrant communities, innovative and successful economies, and engaged and valued citizens. To achieve our vision of helping develop more community vitality, we offer grants to nonprofits and communities, Community Foundation support and regional collaboration. The goal of our grant making is to bring community leaders together in a collaborative and inclusive way to create a shared vision and path towards transformative ideas and goals. SMIF is offering grants of up to $10,000 for these communities to support projects that can demonstrate a collaborative and transformational opportunity for their community. For new or emerging businesses looking for help with start-up operations or in need of gap financing. Up to $5,000 is available for eligible loan activities at a 0% interest rate for a 2 year term. This program currently offers up to $50,000 in matching funds at a 2% interest rate over a 10 year term. The EDA loan provides 50% of the loan amount. The remaining 50% is financed by a local banking institution under separate terms. For projects involving exterior/façade improvements; roof and parapet wall improvements; heating, ventilation, air conditioning, and lighting improvements; utility service upgrades; improvements for energy conservation, health, safety, and building code compliance; interior remodeling; handicapped accessibility. The EDA has been participating with local banks in providing commercial property rehabilitation loans since 1986. During this period of time, approximately $2 million has been loaned for eligible projects throughout the community. For further program information and application materials, please contact David Schnobrich, Community Development Director, at 507-359-8245 or davids@newulmmn.gov. Offered by the Minnesota Historical Society through the Minnesota Main Street program. New Ulm is a designated Minnesota Main Street community. Historic preservation of our downtowns and traditional commercial districts is one of the primary cornerstones to long-term and sustainable economic development within our communities. In order to help maintain, strengthen, and capitalize on a community’s historic resources, the Minnesota Main Street Program offers design assistance to individual property and business owners whose Main Street is one of the Designated Minnesota Main Streets. Storefront re-envisioning can provide helpful design assistance to property and business owners. Ideas presented in these illustrative drawings can help property and business owners envision what the design and preservation possibilities can be for their property. Additionally, schematic façade drawings can be used to raise funds for the rehabilitation of a significant historic building, market the possibilities of a for-sale building, recruit new businesses to vacant storefront, and demonstrate revitalization progress on your Main Street. The design assistance provides important information and recommendations on exterior façade improvements that will improve the appearance and visibility of the building and business while also maintaining the historic integrity of the building and making it functional for the owner’s current needs. The design assistance includes either an on-site visit at the building or phone interview with the property/business owner and the local Main Street manager (or design committee representative). All recommendations follow the Secretary of Interior’s Standards for Rehabilitation. In order to be eligible to receive design assistance, a property/business owner’s building must be within the local Main Street area and be zoned for commercial or mixed-use. The building does not have to be considered “historic” in order to be eligible. Individual owner-occupied residences are not eligible to receive design assistance. Similar to storefront design services, sign assistance can provide helpful design assistance to property and business owners. Ideas presented in these illustrative drawings can help property and business owners envision what the sign possibilities can be for their property. In order to be eligible to receive design assistance, a property/business owner’s building must be within the local Main Street area and be zoned for commercial or mixed-use. The building does not have to be considered “historic” in order to be eligible. Individual owner-occupied residences are not eligible to receive design assistance. Minnesota Main Street Design Assistance is available to designated Minnesota Main Street Communities only. Applicants receiving design services are required to share final project costs, information, and photographs with Minnesota Main Street program. Minnesota Main Street Design Services are preservation-based recommendations that follow the Secretary of Interior’s Standards for Rehabilitation as developed by the National Park Service. Any drawings that may be provided to the applicant are for illustrative purposes only and are not for construction. Design services by Minnesota Main Street are artist renderings and do not take the place of services provided by a registered architect. Minnesota Main Street is not responsible for the non-discovery of any defects in material, workmanship, or other conditions of the property. The property owner/applicant should consult with licensed professionals before embarking on any of the design ideas illustrated. Minnesota Main Street design assistance does not guarantee approval nor does it constitute formal comment of a project under either the state or federal rehabilitation tax credit review process, does not fulfill review requirements pursuant to Minnesota state statute 138 or section 106 of the National Historic Preservation Act, and does not supplant local review authority. There are a limited number of design services that can be requested each year by a designated Main Street Community. Administered by the National Park Service and the Internal Revenue Service in partnership with State Historic Preservation Offices. Historic Preservation Tax Credits are available to building owners interested in substantially rehabilitating historic buildings. Certified commercial structures that are within a National Register of Historic Places district could qualify for a 20% federal investment tax credit as well as a matching 20% state tax credit. Offered through the Preservation Alliance of Minnesota. Through a program of the Preservation Alliance of Minnesota, a building facade can be donated to the organization and leased back to the building owners to provide preservation tax benefits. The program is most beneficial for historic buildings requiring major investment. For more information contact the Preservation Alliance of Minnesota at www.mnpreservation.org or call (651) 293-9047. The National Trust for Historic Preservation issues grants to increase the flow of information and ideas in the field of preservation, stimulate public discussion, enable local groups to gain the technical expertise needed for particular projects, introduce students to preservation concepts and crafts, and encourage participation by the private sector in preservation. For more information contact The National Trust at www.nationaltrust.org or call 1-800-944-6847.